The Catholic Cathedral – is located in the Main Square and was built in Baroque architecture between 1726 and 1733 by Jesuit monks. 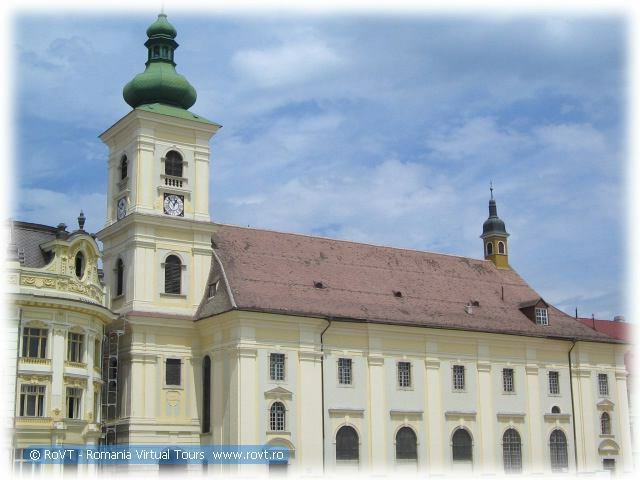 It was hallowed in 1733 Georg von Zonger, the Bishop of Transylvania. The tower, which is separated from the nave was finished in 1738 and the cross on top of the belfry was put in place on the 13 th of September 1739. The funerary monument of general Otto Ferdinand de Abensberg, commander of Transylvania between 1744 and 1747 is inside the church, on the right side of the altar. The tomb was made by Anton Schuchbanu, a sculptor from Cluj. Anton Steinwald, a painter from Vienna, painted in 1777 the fresco located behind the main altar. The confession seats date back to the Jesuit period. The stained glass windows were made in Budapest in 1901 and are also extremely valuable. The Parish House, which once was a Jesuit monastery, was finished in 1739.